Adult apterae of Schizaphis graminum are small and elongate-oval. The head and prothorax is yellowish or greenish straw-coloured. The rest of the thorax and the abdomen are yellowish green to bluish green with a noticeable darker green spinal stripe. The antennae are uniformly dusky. The antennal terminal process is 2.8-4.7 times the length of the base of antennal segment VI. The apical rostral segment (RIV+V) is 0.65-0.8 times the length of the second hind tarsal segment (HTII) (cf. Schizaphis holci in which RIV+V is 0.80-1.0 times the length of HTII). The siphunculi are pale with slightly flared and darkened tips and are 1.3-1.7 times the length of the cauda (cf. Schizaphis holci which has the siphunculi 1.25-1.4 times the length of the cauda). The Schizaphis graminum aptera body length is 1.3 to 2.1 mm. First image: Kent Loeffler (Public domain). Second image: Alton N. Sparks (Creative Common Attribution 3.0 Unported license). Schizaphis graminum alatae have a brownish-yellow head and prothorax, black thoracic lobes and a yellowish green to dark green abdomen. The preferred hosts are grasses and cereals, where Schizaphis graminum can be a major pest. It causes severe feeding damage - initially yellow or red leaf spots which can lead to leaf and root death. It also transmits several plant viruses including barley yellow dwarf virus. Schizaphis graminum develops sexual forms in cold temperate climates, where overwintering in the egg stage occurs predominantly on Poa pratensis, but it continues to reproduce parthenogenetically wherever the climate allows. Schizaphis graminum is not ant attended. Schizaphis graminum is of Palaearctic origin, but is now widely distributed in southern Europe, Middle East, Central and South Asia, Africa and the Americas. Despite the fact that two alatae trapped in UK had identical DNA sequences to the sorghum-adapted form in the USA, there are no records from field crops in northern Europe. We discuss why Schizaphis graminum has failed to establish itself in Western Europe in our rare aphids page. Blackman & Eastop list 34 species of aphid as feeding on Kentucky bluegrass, smooth meadow-grass, or common meadow-grass (Poa pratensis) worldwide, and provide formal identification keys. Of those aphid species, Baker (2015) lists 23 as occurring in Britain: Anoecia corni, Anoecia furcata, Atheroides hirtellus, Atheroides serrulatus, Forda formicaria, Forda marginata, Geoica setulosa, Geoica utricularia, Jacksonia papillata, Metopolophium dirhodum, Metopolophium festucae, Metopolophium frisicum, Paracletus cimiciformis, Rhopalomyzus poae, Rhopalosiphum maidis, Rhopalosiphum oxyacanthae, Rhopalosiphum padi, Sipha glyceriae, Sipha maydis, Sitobion avenae, Sitobion fragariae, Sitobion scoticum and Tetraneura ulmi. Schizaphis graminum has been recorded on 4 species of the Poa genus (Poa annua, Poa bulbosa, Poa compressa, Poa pratensis). Blackman & Eastop list 43 species of aphid as feeding on annual meadow grass (Poa annua) worldwide, and provide formal identification keys. Of those aphid species, Baker (2015) lists 31 as occurring in Britain: Anoecia corni, Anoecia vagans, Aploneura lentisci, Atheroides serrulatus, Baizongia pistaceae, Diuraphis noxia, Forda formicaria, Forda marginata, Geoica lucifuga, Geoica utricularia, Hyalopterus pruni, Melanaphis pyraria, Metopolophium dirhodum, Metopolophium festucae, Myzus ascalonicus, Myzus ornatus, Myzus persicae, Paracletus cimiciformis, Rhopalomyzus lonicerae, Rhopalomyzus poae, Rhopalosiphum maidis, Rhopalosiphum oxyacanthae, Rhopalosiphum padi, Schizaphis graminum, Sipha elegans, Sipha glyceriae, Sipha maydis, Sitobion avenae, Sitobion fragariae, Tetraneura ulmi and Utamphorophora humboldti. Schizaphis graminum has been recorded on 8 species of the Hordeum genus (Hordeum bulbosum, Hordeum distichon, Hordeum jubatum, Hordeum murinum, Hordeum murinum leporinum, Hordeum pusillum, Hordeum stenostachys, Hordeum vulgare). Blackman & Eastop list 47 species of aphid as feeding on barley (Hordeum vulgare) worldwide, and provide formal identification keys. 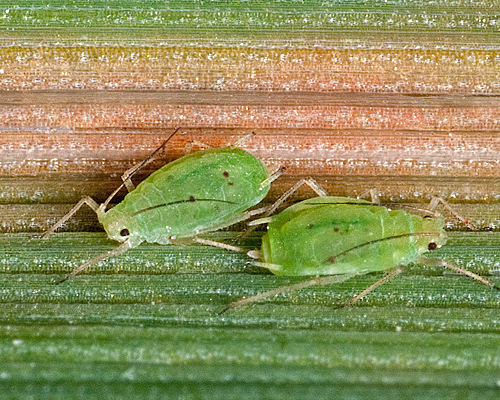 Of those aphid species, Baker (2015) lists 26 as occurring in Britain: Anoecia corni, Anoecia vagans, Aploneura lentisci, Baizongia pistaceae, Cavariella aquatica, Diuraphis holci, Forda formicaria, Forda marginata, Geoica utricularia, Laingia psammae, Macrosiphum euphorbiae, Metopolophium dirhodum, Metopolophium festucae cerealium, Myzus persicae, Neomyzus circumflexus, Paracletus cimiciformis, Rhopalosiphum maidis, Rhopalosiphum padi, Rhopalosiphum rufiabdominale, Sipha elegans, Sipha glyceriae, Sipha maydis, Sitobion avenae, Sitobion fragariae, Smynthurodes betae and Tetraneura ulmi. Schizaphis graminum has been recorded on 3 species of the Triticum genus (Triticum aestivum, Triticum durum, Triticum turanicum). Blackman & Eastop list 60 species of aphid as feeding on 'common wheat' (Triticum aestivum) worldwide, and provide formal identification keys. Of those aphid species, Baker (2015) lists 30 as occurring in Britain: Anoecia corni, Anoecia furcata, Anoecia vagans, Aphis craccivora, Baizongia pistaceae, Cavariella aquatica, Diuraphis frequens, Forda formicaria, Forda marginata, Geoica lucifuga, Geoica setulosa, Geoica utricularia, Laingia psammae, Metopolophium dirhodum, Metopolophium festucae cerealium, Myzus persicae, Neomyzus circumflexus, Paracletus cimiciformis, Rhopalosiphoninus latysiphon, Rhopalosiphum maidis, Rhopalosiphum oxyacanthae, Rhopalosiphum padi, Rhopalosiphum rufiabdominale, Sipha elegans, Sipha maydis, Sitobion avenae, Sitobion fragariae, Sitobion yakini, Smynthurodes betae and Tetraneura ulmi. Schizaphis graminum has been recorded on 2 species of the Zea genus (Zea mays, Zea mexicana). Blackman & Eastop list 47 species of aphid as feeding on maize (Zea mays) worldwide, and provide formal identification keys. Of those aphid species, Baker (2015) lists 23 as occurring in Britain: Anoecia corni, Anoecia vagans, Aphis fabae, Aphis craccivora, Aphis gossypii, Aphis solanella, Forda formicaria, Forda marginata, Geoica utricularia, Macrosiphum euphorbiae, Metopolophium dirhodum, Metopolophium festucae ssp. cerealium, Myzus persicae, Rhopalosiphum maidis, Rhopalosiphum oxyacanthae, Rhopalosiphum padi, Rhopalosiphum rufiabdominale, Sipha glyceriae, Sipha maydis, Sitobion avenae, Sitobion fragariae, Smynthurodes betae Tetraneura ulmi. Schizaphis graminum has been recorded on only 1 species of Oryza: Oryza sativa (Asian rice). 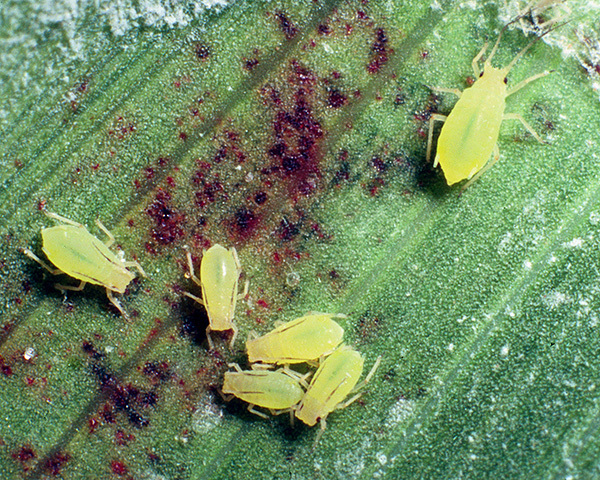 Blackman & Eastop list 34 species of aphid as feeding on rice (Oryza sativa) worldwide, and provide formal identification keys. Of those aphid species, Baker (2015) lists 15 as occurring in Britain: Anoecia corni, Aphis gossypii, Geoica setulosa, Geoica utricularia, Metopolophium dirhodum, Paracletus cimiciformis, Rhopalosiphum maidis, Rhopalosiphum nymphaeae, Rhopalosiphum padi, Rhopalosiphum rufiabdominale, Rhopalosiphum rufulum, Sipha glyceriae, Sipha maydis, Sitobion avenae and Tetraneura ulmi. We especially thank Kent Loeffler and Alton N. Sparks for use of their images, above.